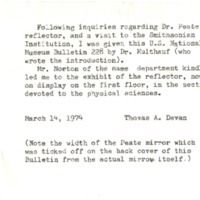 Note regarding the width of John Peate's reflector on display at the Smithsonian Institution. 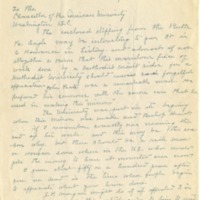 Letter from J.E. Scott to the American University Chancellor suggesting that the University seek funding from a wealthy U.S. citizen to mount the lens. 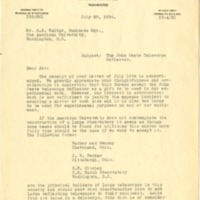 Letter from Robert M. McLellan and William H. Evans to Paul Douglas reporting that Peate's glass lens still had scientific value in 1947 and should be mounted and tested. Letter from J.E. Graf to H.E. Walter acknowledging receipt of Peate's lens as a loan to the Smithsonian Institution. 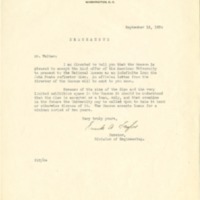 Letter from Frank A. Taylor to H.E. Walter stating the Smithsonian Institution would accept Peate's lens as a loan. 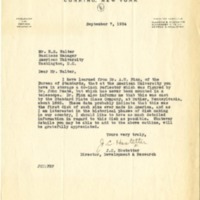 Letter from J.C. Hostetter to H.E. Walter asking for the history of Peate's glass lens. 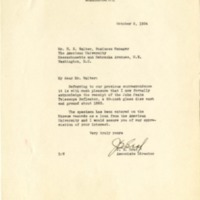 Letter from J.E. Graf to H.E. Walter showing interest in the Smithsonian housing Peate's glass lens in an exhibit. Graf asks Walter for dimensions of the lens and if it requires special care. 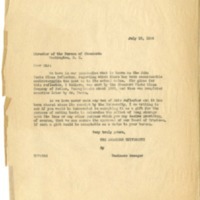 Letter from H.E. 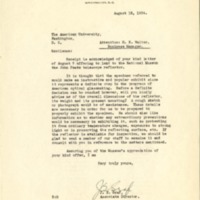 Walter to Lyman J. Briggs offering Peate's glass lens to the Bureau of Standards as a long term loan as American University will not mount the lens. 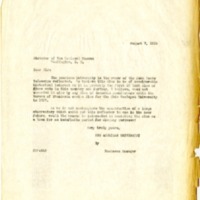 Letter from Lyman L. Briggs to H.E. Walter declining Walter's offer of donation and recommending firms to construct a building for Peate's glass lens. Letter from H.E. 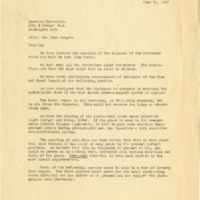 Walter to Frank A. Taylor offering Peate's glass lens to the Bureau of Standards as a donation.